Okay, it apparently it wasn't ESPN, it was The Mountain station, see how much I know. LOL! I meant to post this last week when talking about BYU football was a happy thing. (FYI, they lost to their rival, University of Utah this weekend by one tiny point. It was a heart breaker.) Our neighbor had a couple of extra tickets to the game last weekend and offered them to Jarom. (Third row, end zone seats. Who'd say no to that?!) So Jarom hopped right on that train and called our brother in law, Brandon (who has been so kind as to offer Jarom a couple of tickets this season as well) and they all headed to LaVell Edwards Stadium to watch their beloved BYU. 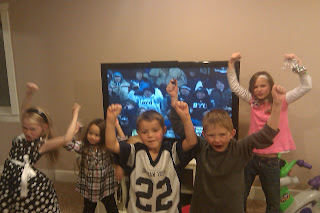 The kids and I joined Justin and Amber in Blackfoot to watch the game and HOPED we'd get a glimpse of the guys on tv. With such good seats, we were bound to at some point. Sure enough, near the end of the game (which BYU won!) a big ol' close up! 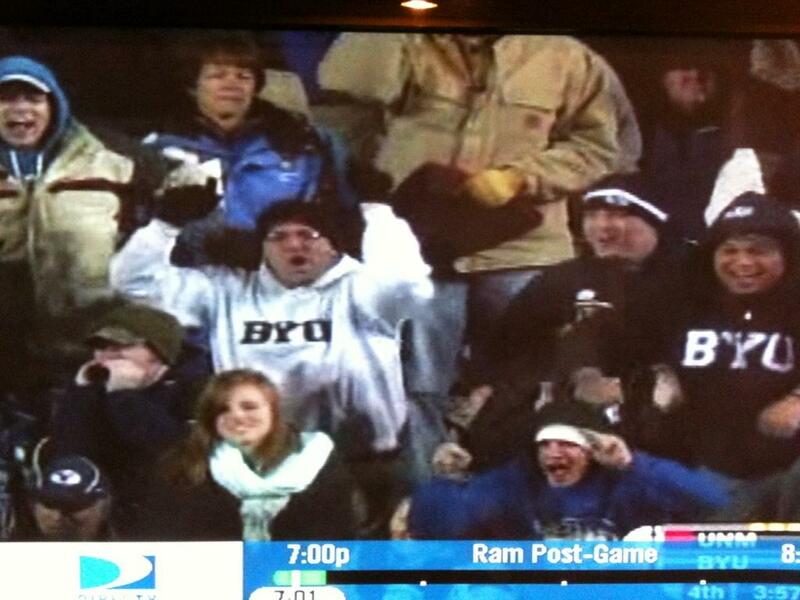 Jarom is in the white BYU sweatshirt and Brandon is the right in the black and white stocking cap. The kids were so excited to see Jarom and Brandon on t.v. 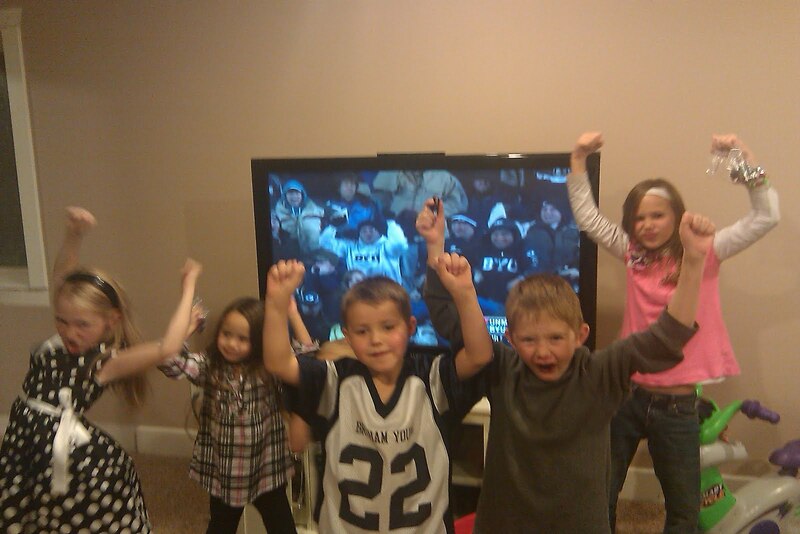 It was hilarious to see them all cheering right along with them. What a fun day for everyone! All this cold air plus a dose of the seasonal cold bug has caused Kate's asthma to rear it's ugly head. Poor girl is hacking like a smoker. We've got her on some steroids and breathing treatments for the next few days and hope she'll be feeling better soon. I'm so grateful for our own personal nebulizer we bought through ebay to keep on hand for just these kinds of events. Hopefully that will lessen the midnight ER runs for us. We've been enjoying staying warm and cozy in our pj's all week (as the kids have school off for Thanksgiving break) watching movie after movie. Including, but not limited too, a Harry Potter marathon. Saw the new movie last night and thought it was fabulous. Tomorrow we will attempt to forge our way out to my mom's house (actually the roads are much better now, it's just freezing cold) to enjoy a yummy Thanksgiving feast. We have much to be thankful for and it is nice to have a holiday dedicated to just that. Hope you all have a wonderful holiday and stay warm! Update: For my warm and balmy weathered Southern friends, here are pictures. Snow in the middle of the road waiting for the snow plows to scoop it all up. A path for a turn lane equals big piles of snow. Home Sweet Home, snug and warm inside. The reality of snowy days. Kate turned FIVE today!!! Yes, we're a little birthday crazy around our house this time of year. Everyone has a birthday except Carter, and he is feeling rather left out at the moment. No matter how brother was feeling, Miss Kate had a glorious day. It started with birthday pictures with her best buddy "Hearts". After this picture she informed me that she was ready to open the "new pretend shoes" (dress up high heels) that she had noticed in my room. The little peeker...although it was my fault. I thought I had hid them, when really all I did was set them on my nightstand. I swear I'm going crazy. Then off to preschool with some more buddies. Actually, I had NO clue Kate felt as friendly towards these girls as she acted for these pictures. She's normally ULTRA shy and a bit picky about who she views as friends. I walked in to watch her cute little preschool program and she instantly demanded pictures and started posing. It was quite hilarious really. Miss Kris, her teacher, made her a crown for the day. Kate wore it proudly, even to the store. To be quite frank, I was a little partied out, and opted to let Kate pick a cake from the store rather than make one. A task which required 3 different stores and a pit stop at McD's, until we found the perfect one, but when she saw it, it was love at first site. We are so glad we have great family and friends who could pop on over and make it feel like a party for Kate. 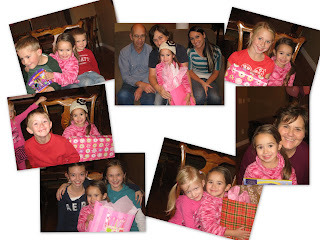 She had a ball, and is in love with every gift she received. (By the way, check out the SUPER cute hat my sister made. So fun!) I'm missing this fun toy stage with my older girls. It goes WAY too fast. She's still learning her ABC's but she gets tripped up on K every time. Well, the alphabet needs some work, but at least she knows how to spell her name. How Can She Possibly Be 10?! My babies just keep growing and growing. Halle hit the double digits yesterday. It is crazy to me that she can really be 10. She was 6 months old, 6 MONTHS!, when we bought our first house in Nampa. That seems like such a short time ago and here it is 10 years later already! Halle has partied all weekend long. It started with a sleepover with cousin Liberty on Friday night. Liberty gave Halle a scrapbook for her birthday so we had to have a quick photo shoot and print of some pictures to create the first page. But nothing says "I'm Halle" better than a few silly and fun poses. This girl is ALL about fun. But Halle seemed pleased with them, so that is all that mattered. The "rockers" ready to PARTY! We borrowed a karaoke machine from a neighbor and the girls rocked out to Hannah Montana and Disney remix songs. They had a riot running the lights, being back stage dancers, audience members, and of course performers. So funny to see each of their personalities come out on "stage". Halle and all her little guests. You really should click on this collage and make it come up large size. Halle is just such a photogenic little thing (as are all her beautiful friends); I just can't get over how pretty she is. Halle is CONSTANTLY running the battery down on my camera by making videos. So we decided to give her her very own video camera for her birthday present. I have never heard of a "Flip" before, but the minute she saw it she said, "I got a FLIP!!!" She knew exactly what it was. We've been filming away ever since. She's currently working (with her dad) on a darling little video which I will share as soon as it's done. I hope this little girl's every wish comes true!! Happy Birthday to my sweet Halle!! I love you Baby.